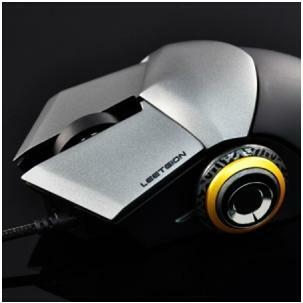 Thermalright Company has recently launched its second generation gaming mouse, naming Leetgion. Hellion model was designed for strategic gaming actions like StarCraft II, the new mouse El’ Druin focusing on those gaming lovers who are fond of Diablo III and RPG genre. Leetgion has twelve programming buttons, and five way joysticks which will be placed under the users’ thumb. In Leetgion, two main buttons are used for mechanical switches Omron. The mouse has been added with laser technology with Sensor Avago 9500, and its resolution can be set between 100 to 5000 dpi and manually can be changed by the users manually. Gaming navigation requires the fast and smooth navigation which is usually hard to operate with simple 2D operations mouse. A 3D mouse is fast indeed and its laser technology and USB port connectivity was the first feature which enabled the users to connect them with laptops and PCs easily. Four user profiles are available now with latest edition for gamers to store many versions of macros and layout from standard versions. Gaming industry which is currently in its boom stage and latest versions of Electronic arts and Word of War craft, modern warfare three and sports gaming have been launched soon. Gaming lovers need advance to advanced technology for experiencing the new high peak graphic developed games. Leetgion, the new second generation model from Thermalright Company is composed of two words, Leet+ Legion. Leet is an internet phrase which has been taken from word elite basically, Elite means a group or fleet of superior skills people or powers working together. Legion means a group of war qualities individuals who are fighting against each other and eliminating everything which comes in their way. So our self description of new mouse name is a group of elite individuals who are fighting hard against each other and conquering anything which will come in their way. Thermalright company has decades of experience for working with products for thermal heat of the computer hardware. They have experience about what PC users need and what are the current needs of gaming lovers. We are going towards the high quality components developed under latest technology, which has made the things possible for us. Leetgion know that because of sharp human skills and being the owner and creator of computer will at last win the game. It has a dedicated attack button along with Cherry-MX blue mechanical switch and 16.8 m illumination of colors.